Lapolla Industries Inc. has made available FOAM-LOK 2800-4G Spray Polyurethane Foam for roofing. Lapolla Industries Inc. has made available FOAM-LOK 2800-4G Spray Polyurethane Foam for roofing. The fourth-generation SPF eliminates ozone depletion potential and reduces global warming potential. 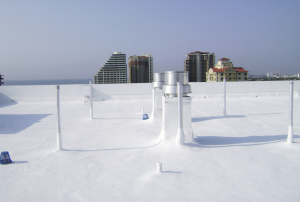 The rigid, closed-cell SPF may be applied over most new or retrofit roofing substrates. FOAM-LOK locks every portion of the roof into place, creating a monolithic membrane and eliminating the need for mechanical fasteners. The product seals the envelope, which minimizes the escape of conditioned air and dramatically reduces the structure’s energy consumption for heating and cooling, in turn reducing energy costs over the life of the roof. The low-maintenance material also resists wind uplift and acts as a waterproofing solution.